Construction on the Purple Line could be on the horizon. Maryland Gov. Larry Hogan has been given the green light to the planned light rail system. He announced Tuesday that, following a bid process, his administration has selected Purple Line Transit Partners to build the line. Purple Line Transit Partners is a partnership of three public-private partnership developers and equity investors, Meridiam, Fluor and Star America, according to the group's website. The Maryland Department of Transportation says the group promised upfront construction costs would be less than $160 million, coming in $8 million below Hogan's threshold for supporting the project. 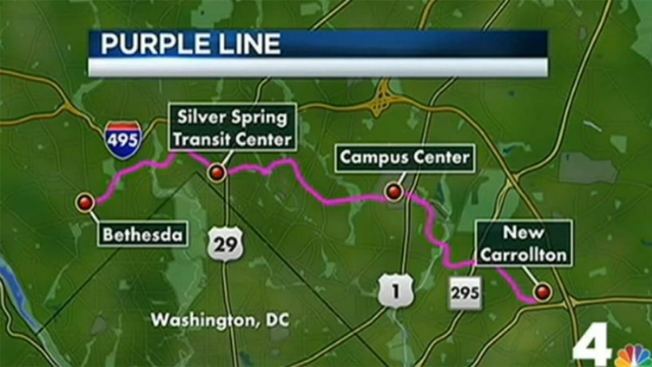 The Purple Line, a 16.2-mile connection between Bethesda in Montgomery County and and New Carrollton in Prince George's County, is expected to open in 2022. Last June, Hogan had said the project could move forward if three conditions were met: additional funding from local governments, federal funding and "aggressive pricing" from the selected construction company. "After eight months of hard work and tough negotiating, the Maryland Department of Transportation has met all three of the needed requirements and delivered a cost-effective Purple Line with a strong commitment from our federal, county and private partners," said Hogan said in a statement. The Prince George's County Council said it was "elated" that construction is on the horizon. "The Council is working to create walkable, vibrant communities that include a mix of housing, jobs and retail. This work includes developing a premier network of transportation choices to ensure residents can reach their destinations easily and safely, and attract transit-oriented development, especially around the County's 15 Metro stations," the statement said in part. Prince George's County Executive Rushern Baker said the announcement is welcome news. "The Purple Line is an important state transportation project that will spur economic development, reduce traffic and lead to greater environmental sustainability for Prince George's, Montgomery, and neighboring counties throughout central and southern Maryland," he said in a statement. However, a lawsuit could stop the project in its tracks. Friends of the Capital Crescent Trail have filed a suit to stop the line from being built along the popular biking and walking trail. "I think the group that has filed the lawsuit is on the wrong track," said Montgomery County Council Member George Leventhal. Some residents say they hope the new rail system and the trail can co-exist. "They both serve the community," said cyclist Youmon Tsang.